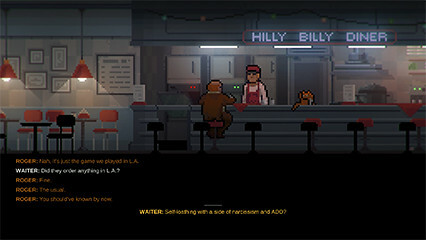 The Long Reach from Ukrainian developer Painted Black Games is a side-scrolling adventure game, which features some old-school gameplay from the point and click adventure genre. The story that unfolds is an unsettling horror trip through a shady research lab, where an outbreak threatens to cause the collapse of civilisation; but is it really as scary as it thinks it is? Eek! This party has gone downhill rapidly! I did warn them about those Jägerbombs too! You play the role of Stewart, a research assistant at a lab in a small American town. Something goes wrong after an experiment (doesn’t it always? ), which unleashes some form of outbreak that has turned the staff of the facility into slavering bloodthirsty lunatics. You need to find a way to survive and escape from the facility, and hopefully find some help to stem the madness that has been unleashed. 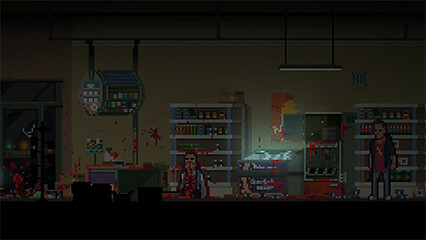 The game features a rather nice retro pixel art style, with Stewart wandering around the facility interacting with any objects that are highlighted by a Ready Brek yellow glow around them. There is sparse lighting which adds to the creepiness factor, and it features a quite brilliant soundtrack that really adds to the unsettling atmosphere. The only problem is, despite the oppressive atmosphere, the game really isn’t very scary at all. You bump into the occasional crazy guy with a knife, who grunts at you and runs after you, but there aren’t even any real jump scares, which for a horror game is quite disappointing. The story features plenty of twists and turns, and becomes more surreal as the story progresses, which helps to show how Stewart’s psyche is starting to unravel. You start to see things which don’t actually happen, and there are times when the game puts you in control of other characters, which can catch you out and leave you questioning what you’ve just seen. Phew! Am I glad I escaped from that facility! Like most point and click adventures you wander through the various rooms looking for items to pick up, which you can then use with certain other objects or parts of the background scenery. For instance, one puzzle has you trying to start a generator to get the lights and electronic doors working. To do this you need to find various items scattered around the facility. Thankfully the puzzles are quite logical, so once you pick up an item you have a good idea of what you need to use it on. This keeps the game flowing quite nicely, although there is still an element of trial and error with what items to use. There are a few characters you interact with during the game, and some nice bits of humour thrown in to lighten the mood. However some of the interactions can see your character giving some quite snarky responses, which does seem at odds with the whole psychological nature of the narrative. We also found that while you had multiple answers to choose from during conversations, it didn’t really matter what you chose to say, as it never altered the trajectory of the story. We had technical issues with the game, with it crashing perhaps half a dozen times. There were a few instances where our character simply stopped moving, as if your controller had died, which forced us to reset the game. One time the game completely failed to load, which was quite worrying as we thought we’d lost all our progress. The lengthy load times are also frustrating, as it can take several minutes for the game to load up. Hopefully the developer will fix these issues with some patches down the line, but at the moment they are still quite annoying. Also, while the pixel art graphics are nice, the setting has perhaps a tad too many grey corridors for our liking, and at times you can get quite lost as each corridor is very similar to the last. Things get better in the second half when you leave the facility behind for a while, but the game could still have done with a bit more variety in the levels. 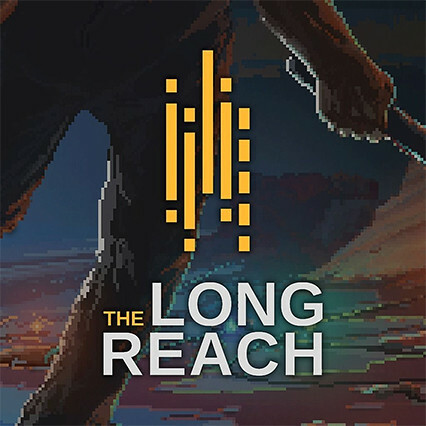 The Long Reach is a decent psychological thriller with some satisfying puzzles. However it’s let down by a quite linear story and some annoying bugs and unacceptable load times. The fact that it isn’t scary in the slightest also works against it, as we had hoped to have a few scares to help liven things up; but instead, all you get is chased around the corridors by a knife wielding goon, like a psychotic Benny Hill sketch. Also the bland, dark grey corridors of the facility become a bit of chore to walk around after a while, and it could really have done with some more variety in the levels. Some of the sarcastic humour also misses the mark, and doesn’t fit in well with the whole oppressive atmosphere and general narrative. 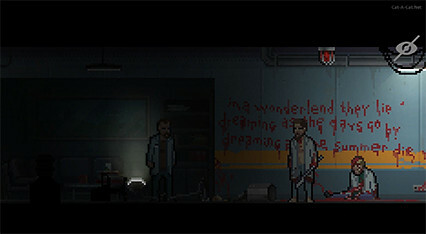 However, you may just find yourself getting pulled into The Long Reach’s surreal world of madness and mayhem.